Intense zooming at an incredible value. Capture the action from a distance with natural details with this lightweight telephoto zoom lens that's great for beginners and pros alike. If you don't have a telephoto zoom lens in your arsenal, this is a great place to start. 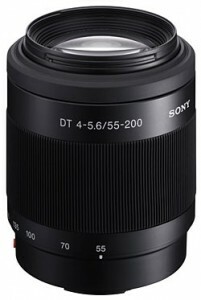 The superb multi-purpose SAL-DT55200 55-200mm /f4-5.6 telephoto zoom lens is an excellent all-around value, covering the medium to long-distance telephoto range you will use most. It also provides close minimum focusing distance of about 3 feet (0.95m), for tight shots of people, natural subjects and close-up details. Its compact, lightweight design makes it easy to carry as your standard or accessory lens--and all your shots will benefit from the Sony Super SteadyShot® image stabilization system built into every Sony α system DSLR. (35mm equivalent: 82.5-300mm). This high-value 55-200mm zoom lens covers a wide range of medium to long-distance telephoto applications -- and its lightweight design lets you leave it on-camera or carry it easily as an accessory lens for special purposes (35mm equivalent: 82.5-300mm). The SAL-DT55200 is specially designed for the APS-size CCD imager used in Sony α (alpha) DSLR cameras. 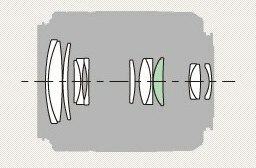 APS-size sensors are smaller than a 35mm-format film frame, so the focal distance to cover the same field of view can be about 2/3 shorter -- allowing a more compact lens design. With the ability to focus as closely as 3 feet (0.95m), this telephoto lens also lets you move in for dramatic shots of people, natural subjects and close-up details. A major reason for its compact, lightweight design is the benefit of Super SteadyShot® in-camera image stabilization, built into every Sony α system DSLR -- and enabling accessory lenses to eliminate the extra weight and expense of in-lens stabilization mechanisms. The SAL-DT55200 is designed with 13 lens elements in 9 groups, with precision focusing performance and smooth zoom operation. Because light of different wavelength (or color) bends at different angles when it passes through a lens, ED (Extra-low Dispersion) Glass is used to eliminate chromatic aberration by correcting certain wavelengths of light for sharp, clear images with well defined colors. Rebranded Tamron AF 55-200mm F/4-5.6 Di II LD Macro A15.